Philadelphia, PA (June 17, 2010) – Recently, the EPA created new lead paint regulations for all structures built before 1978 that will fundamentally change the way property owners and managers, contractors, maintenance workers, painters, real estate developers, and others need to conduct business practices. 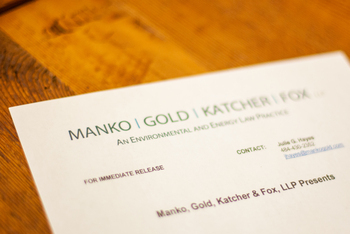 On Wednesday, June 23, from 8:30 a.m. to 11 a.m., Manko, Gold, Katcher & Fox, LLP (MGKF), the environmental, energy and land use law firm, and ALC Environmental, a national environmental and engineering firm, will host a special program discussing these new regulations. The breakfast event will be held at the MGKF offices at 401 City Avenue, Suite 500 in Bala Cynwyd, PA. CLE credits are pending. There is no charge for the program, but participants must register in advance at www.mgkflaw.com.